Optional: 1 dozen Shrimp and Cognac. 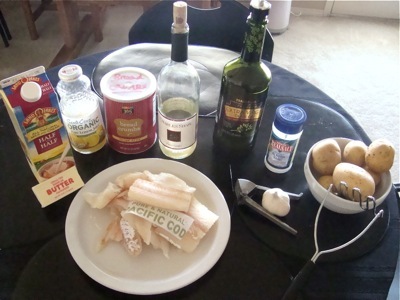 In a large pot pour the Wine and add the Cod. When you reach boiling, simmer for 10 minutes. 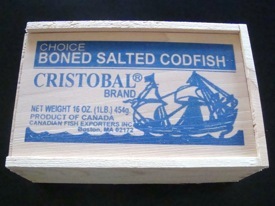 Optional: if you are using Boned Salted Codfish put the Cod in a large water bowl for 24 hours, then remove the Cod and pat it dry with paper towels. Remove all the small bones you can see. 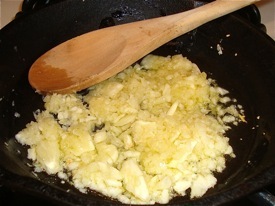 Put 2 tablespoons of Olive Oil in a small cast-iron skillet and add the minced Garlic. Heat until the Garlic is tender. 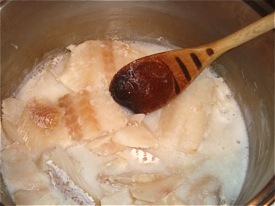 Flake the Cod, add the Garlic, what is left of the Olive Oil, the Lemon Juice, Salt and Pepper. Start the heat and when it starts boiling simmer for 5 minutes. Peel and cut the Potatoes in small pieces. Boil them in water with Salt and 1 teaspoon of Garlic Granules for 15 minutes. 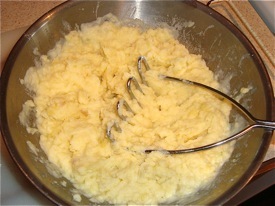 Remove the Potatoes from water, add the Half & Half and 2 tablespoons of Butter. 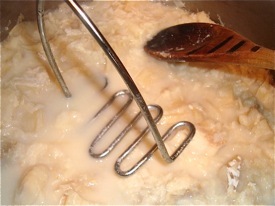 Mash the Potatoes until creamy, then add the Cod and mix well. 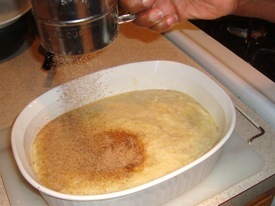 Drop the mixture in a baking pan, brush melted butter on top, dust lightly with Bread Crumbs. 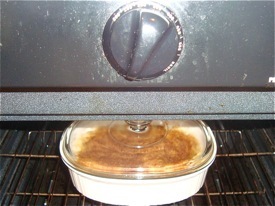 Cover and put in the pre-heated oven at 300 for 30 minutes. 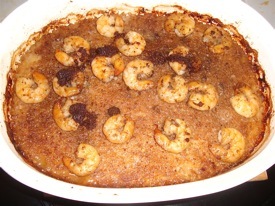 Optional: Put the shrimp in a skilled with 1 tablespoon of Butter and 1/2 a teaspoon of Garlic Granules. Cook the Shrimp at high temperature. When they are done pour in the pan 2 oz of Cognac and strike a match. Be careful, the flames can be very high for about 30 seconds. Before serving decorate the top of the Brandade de Morue with the Shrimp. 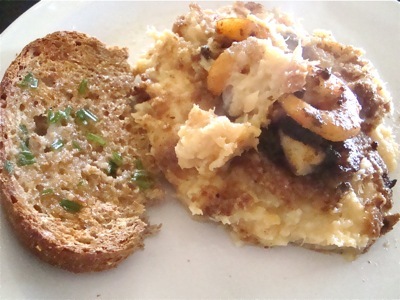 Serving of the Brandade de Morue on a dish.